REGAL RUBBISH: Lush, why so intimidated? By now I'm pretty sure everyone in the world knows about Lush, so in no way do I think we're breaking big news on Regal Rubbish about how great their products are! What I do know, is that most men avoid Lush like the plague. Is it the scents or the large crowds of women taking over the store? It could just be a mix of both. I used to be one of those guys that hated having to walk into Lush with family or friends that had to "quickly pick something up." Eventually someone actually convinced me to try out their products, and ever since I've been hooked! When it comes to taking care of my skin, I fall into the category of guys that just don't have time for that. Most nights I just splash a little bit of water and head to bed, only to repeat the same process in the morning. There are three products however that I manage to fit into my routine at least a couple times a week and trust me it makes a difference. This is my number one go to product. If you are going to use anything on this list, let it be this guy. I use the original recipe, however they did recently come out with a second Ocean Salt. 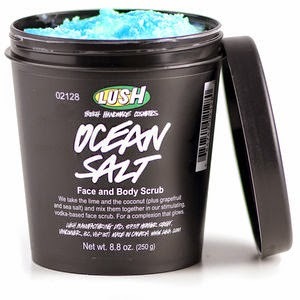 The original Ocean Salt contains Sea Salt (makes sense), avocado butter, fresh limes and a Vodka base. Yup, sounds kind of delicious... I know. The sea salt in this scrubs really well so that you feel like you're really getting a clean wash. I use this after shaving as I've found that it not only helps prevent ingrown hairs but it also helps pull out the ones that I already have. I've also used this on my upper arms as I have a tendency to get in grown hairs and that "chicken skin" effect. I've found my skin to be a lot more clear and soft after using this product. The first product I tried from Lush, with a charcoal base, black sugar and avocado oils, you definitely feel this one cleaning your face as well. I usually scrub this on my face as a mask before I get into the shower and just let it wash off as I go. (Note: The charcoal makes one hell of a mess in your tub and you will have to scrub it down after.) I've found that this is the product that really helped control my acne. Now this guy I use a lot less than the other two. This product is super soothing. A mixture of seaweed, aloe and calamine powder, it's no surprise why your skin feels so smooth after using this. I tend to wash my face with this if I'm going out somewhere special and really want my face to look and feel it's best. With these three products it's really hard not to keep up a small routine. Even if you keep it as an after shaving routine like I do, as I tend to only shave once a week it's really easy to just cleanse my face immediately after. 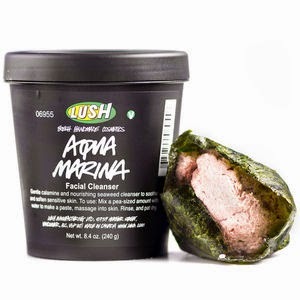 Lush also has a great line of after shaves, shampoos and soaps that I have yet to try! So guys, don't let the store intimidate you! Stop in and pick up some of these products, your significant others will notice a difference and trust me, it'll be worth it! (And hey, if you're still too intimidated to get into a store, you can always order online!